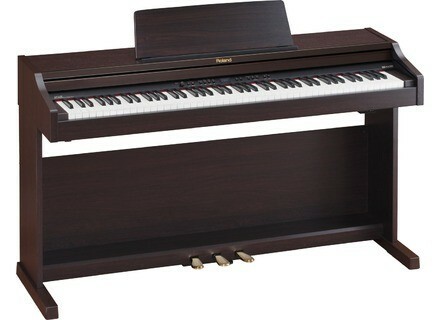 RP301, Digital Piano from Roland in the RP series. Roland announces the RP301 Digital Piano. The RP301 is outfitted with the Ivory Feel-G keyboard and features a progressive hammer action designed to reproduce the feel of an authentic acoustic grand. A panel layout with dedicated buttons provides access to the RP301’s sounds and functions. Education features include a built-in metronome, as well as Twin Piano mode, which splits the keyboard into two identical zones for side-by-side instruction and duet playing. Also onboard is a recorder that lets users capture their performances. Two finishes are available to suit various homes or music schools’ decor: Satin black (RP301-SB) and Simulated Rosewood (RP301-RW). The RP301 will be available in February 2012. [NAMM] Roland HP500 Series Roland announce the HP500 series, the latest additions to its lineup of cabinet-style digital pianos. [NAMM] Roland LX-15 Roland introduces the LX-15 Digital Piano, an upright-style instrument with grand piano sound and attitude.